I’m raw and unbalanced, hung over from a bout with beer and whisky. I skipped going to work today. It’s gray, overcast and generally gloomy. Besides, it’s a Saturday, and a Fourth of July weekend. I hate working weekends, especially holidays, but I’m getting used to it. In this economy, few can afford to turn down work. I awakened early, before 7 a.m, and rode my bicycle to the park to practice aikido, a Japanese martial art designed to defuse conflict, with a friend. It’s been a long time since we’ve done this. It helps me keep an even temper. Even with a hangover it felt good to tussle and talk. We usually talk politics and the economy. He hasn’t worked in nearly four months; I’m barely employed, working as a farmhand and laborer. He’s a union carpenter and, until recently, supported a family of six; the last of his four children graduated high school last year. Finances aren’t as critical now as they used to be. Still, like everyone else, he needs to pay the bills. Everyone but the banks and military is bankrupt, I say. “What’s wrong with this country?” We launch into another frustrated, cynical litany of ills that plague our nation: Militarism, greed, corruption in government and business, a weak economy and an empire in decline. “This can’t go on forever,” he says, “we’re more than a trillion dollars in debt.” If anything, the message of the last two years of economic failure has been: The party’s over. The excesses of our revered material lifestyle have drained our accounts and left us empty handed. Most Americans, hopeful as ever, seem to think the party has merely lapsed into a sustained lull. Things will get better, they say. The markets will regain their vigor, jobs will become available, and spending will save the republic. Cayucos loves a parade, and its freedom. Our small town plays host to more than 20,000 visitors during the Fourth, who come to celebrate their freedoms by eating hotdogs, playing in the sand, and shopping at the flea market, known by locals as “crap on the creek,” mostly throw-away junk. The word “freedom” gets tossed around pretty easily these days, as if we all agree on what it means: Freedom of the press, speech and religion; the protection of personal effects from government search and seizure, the right to trial by a jury of peers, the right to bear arms. More often, however, “freedom” becomes an amalgam of unspecified ideas and feelings, which patriots will defend to the death, about what it means to be an American, which usually includes waving the flag, getting goose bumps during the singing of the national anthem, and chanting “U-S-A!” at soccer games. Upon closer review, this muddle of feelings and ideas about freedom just as likely arises from the belief that Americans are unique in exercising their right to get rich by whatever means possible, to spend money freely without end or hindrance, even when there isn’t any to spend. “Freedom isn’t free,” we’re told in countless bumper stickers meant to remind us of the sacrifices that have been made on our behalf. Soldiers, mostly young men, have given their lives to ensure we continue to enjoy the clear advantages of being an American, including the right to spend our diminished earnings at any outlet of our choosing. Fourth of July, as often as not, has come to be celebrated not so much for the Declaration of Independence from tyranny as for America’s great military empire and raw technological power, which still has not squelched terrorism, but nonetheless allows us to conduct full-scale war without the requisite sacrifices at home. We can still shop at Wal-Mart and spend freely without guilt while others shed blood in foreign lands to stop the amorphous terrorist cell sprouting everywhere like a cancer across the globe. In my weakened mental state, I don’t argue the point. He’s right, the War on Terror, as most wars, was a sham from the start. We still haven’t caught Osama bin Laden, our invasion of Afghanistan has become America’s longest-ever war, and the Taliban is as strong as ever. Already, chairs have been placed in a mass claim for seating along the parade route. Police tape has been pulled through lines of chairs, marking seating sections between groups of the nearly 20,000 spectators who will gather for tomorrow’s parade. They come from all points: San Francisco, Fresno, Bakersfield, Los Angeles. It’s the busiest day of the year for our little town of less than 4,000. The parade features the usual Independence Day amusements: Spectators waving American flags, young gymnasts cart-wheeling, local bands rocking on flatbed trucks, grannies dressed in patriotic colors, waving to the crowd from old jalopies. Once, an outfit of youngsters from Fresno, dressed in paramilitary uniforms, marched crisply in rigid formation, looking distressingly similar to the Brownshirts who helped the Nazis in their rise to power. “I’m not that patriotic,” Patrick says. “It’s all a gimmick.” If they can get you to believe their story, such as “we need this war,” he adds, they can get you to do anything they want. Last year, one of the grass-skirted matrons from a beach-chair drill team bolted from the formation as it approached the entry point of the parade. “Hey!” she waved, beckoning me to wait for her. She threw her arms around my neck, firmly pressed her middle-aged buxomness against my body, and planted her lips on mine. The rank smell of alcohol at 10 in the morning assaulted my senses. Before I could pull away, I felt her tongue probing my mouth. “Yuck!” I turned my head away and slipped out of her arms. She ran back to her group as if nothing had happened. Cayucos is a friendly place. “Did you see that?” I asked my girlfriend. You never know what’s going to happen at the Cayucos Fourth of July parade, but one thing’s sure: Just about everyone here’s proud to be an American, with or without their hangovers. Journalist Stacey Warde blogs about everything at Rogue’s View. The Cayucos parade is one of the few great events where you can decide at the last minute whether you want to watch the parade or be in it. My family has attended the parade for 23 straight years. We were in it one year and unfortunately that was the year that a couple got married on a float during the parade and we missed it because we were 20 floats back. AND unless i am mistaken, the bellydancers are getting younger…some of them are in their 40’s. I will share with you my dream team for the parade: 52 folks each with a placard of a playing card, ace thru king….clubs thru diamonds. The drill routine would be to march along and every once in a while shuffle ourselves and deal out 2 hands of stud poker. We could even have a few folks dressed up as chips and make bets. Any volunteers ? I think that woman kissed me too. 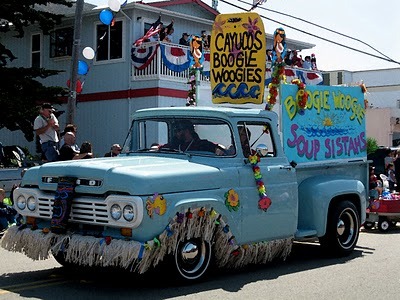 Cayucos parade is the best on the Central Coast but can someone tell me why the Tribune didn’t publish a single picture of it in Monday’s paper? I guarantee you they had a photog there. Instead they highlighted the Templeton parade which from the looks of the photos had about 50 people watching grandpa drive a tractor through town. That’s why I use the newspaper to line my litter box. Not much worth reading in it. It might be good for a coupon or two but that’s about it. This article is clearly marked “opinion”. Makes me miss The Rogue Voice.